George Graham Reviews Scott Vestal's "Millennia"
The banjo is a very old instrument, going back in various forms hundreds of years to many different cultures on different continents. In the 20th Century, it was first known for its use in early jazz, and for the past half century, the banjo has been synonymous with bluegrass. Despite its long history, the instrument is notoriously limited in its capabilities due to its trademark inability to sustain notes and rather narrow dynamic range. But since the rise of so-called New Acoustic music in the 1980s -- which took the instruments of bluegrass and combined them with an amalgam of styles from jazz to world music -- the banjo has seen its horizons vastly expanded. Tony Trischka was one of the first banjo innovators in New Acoustic Music, and of course, Béla Fleck has become synonymous with unconventional banjo with his Flecktones group, who have achieved surprising popularity among the general public, considering how innovative their music is. Fleck has also become an extraordinary composer as well, regardless of his instrument. This week we have another very eclectic banjo innovator who has just released an impressive solo album. 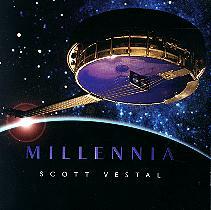 Millennia is the name of the new CD by Scott Vestal. Like most banjo players, Vestal got his start, and indeed has spent most of his career playing bluegrass. He began playing professionally at age 18 as member of the Larry Sparks Band, had his own group for a while, then joined Doyle Lawson & Quicksilver, the venerable bluegrass institution, for four years and five albums. He has also been a member of Livewire, another fine group he founded, and later played with Continental Divide. Recently, he has also been working as a studio musician producing records in Nashville, including a series called Bluegrass '90s. Now Vestal has taken the plunge into the world of banjo exploration and the results are quite impressive. Millennia is almost breathtaking in its range of influences, from art rock to funk to bebop to classical, with a little bluegrass thrown in for good measure. Vestal also plays a distinctive instrument he designed called the "stealth" banjo, which is made rather like a five-string version of the Telecaster electric guitar with a banjo pot for a body, and a striking-looking black head on the round resonating chamber. Another interesting feature of the stealth banjo is that all the tuning pegs are on the head, rather than having the fifth peg part way down the fretboard as is standard practice on five-string banjos. Vestal also attaches his banjo to synthesizers and in this way, comprises much or most of the band on some of the tracks. The result is vaguely reminiscent of the Flecktones, but taking a number of different directions, including having more vocals. Joining Vestal on his CD is John Cowan, the bassist and lead singer of New Grass Revival, where Fleck spent a decade. Cowan does this CD's vocals, including a fair emulation of Jon Anderson of Yes in Vestal's remarkable cover of a Yes art-rock classic. Also appearing on Millennia are Reese Winans, formerly of Stevie Ray Vaughan's Double Trouble, on keyboards, Pasi Leppikangas on drums and a rotating cast of other characters including Jeff Autry and Jim Hurst on guitars, plus Stuart Duncan, Kati Penn and Rickie Simkins on fiddles. The "stealth" banjo is basically an electric instrument, amplified as it is, but overall sound of the CD is an electric-acoustic hybrid, often less electric than the Flecktones. Though the album's most salient tracks are its covers of Yes, Mozart and Charlie Parker, the rest of the material consists of original compositions by Vestal, who runs the gamut in his own material, from funky, to jazz-rock fusion to bluegrass to New-Age-influenced. On an album this wide-ranging stylistically, some tracks obviously work better than others. The bluegrass-influenced pieces are perhaps the most fluid and convincing in terms of performance, but the fusion and art-rock material, with odd time signatures and elaborate arrangements also stands out for its combination of skill of execution and sheer musical chutzpah of doing such a thing on a banjo. The banjo has certainly come a long way in the last couple of decades, from its being synonymous with traditional bluegrass to being part of some very eclectic music. Scott Vestal joins Tony Trischka, Béla Fleck and others like Gordon Stone in further pushing the boundaries of the instrument, in both style and in physical modification of the instrument. With over twenty years of playing bluegrass professionally with some well-known groups, Vestal has come up with an album that combines a particularly wide range of styles. Though there are some weaker moments, most of Millennia is a musical delight, and Vestal's version of Long Distance Runaround alone is a good reason to seek out this CD. Throw in Mozart, jazz-rock fusion, some funk, and yes, even some bluegrass, and you have a worthwhile and downright entertaining CD. Sonically, Millennia gets generally good grades from us. The blend of acoustic, electric and electronic instrumentation works well, though sometimes the acoustic instruments almost sound electrified, and the ersatz piano and other instruments created by the keyboard synthesizer are a bit disappointing. The dynamic range and sonic clarity are both decent, though not exactly stellar. It does reward playing on a good stereo system. Though Vestal brings a different set of influences his music, fans of Béla Fleck and the Flecktones, and those who generally enjoy hearing musical boundaries smashed are likely to find much to enjoy on Millennia.